This original painting is currently available for purchase. For more information please contact here. Scarface is a 1983 American crime drama film directed by Brian De Palma and written by Oliver Stone, starring Al Pacino. It is a remake of the Howard Hawks’ classic gangster 1932 film of the same name. The film tells the story of Cuban refugee Tony Montana (Al Pacino) who arrives in 1980s Miami with nothing and rises to become a powerful drug kingpin. The cast also features Mary Elizabeth Mastrantonio, Steven Bauer, and Michelle Pfeiffer. 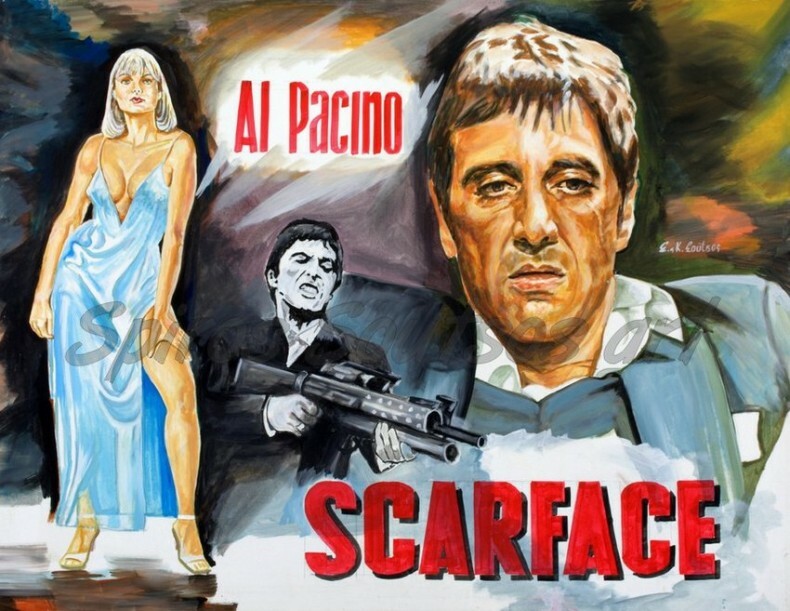 Scarface began development after Al Pacino saw the Howard Hawks 1932 film at the Tiffany Theatre while in Los Angeles. He later called his manager, producer Martin Bregman, and informed him of his desire for a remake of that film. Pacino originally wanted to retain the period piece aspect, but realized that because of its melodramatic nature it would be difficult to accomplish. Sidney Lumet became attached as the director, developing the idea for Montana to be Cuban arriving in America during the Mariel boatlift. Al Pacino insisted on taking the role of Montana, although Robert De Niro was offered it but finally turned it down. Pacino worked with experts in knife combat, trainers, and boxer Roberto Duran to attain the body type that he wanted for the role. Pfeiffer was an unknown actress at the time, and both Pacino and De Palma had argued against her casting, but Bregman fought for her inclusion. Glenn Close was the original choice for the role, while others were also considered, as Geena Davis, Carrie Fisher, Kelly McGillis, Sharon Stone, and Sigourney Weaver. Scarface was released on December 9, 1983 and was a box office success, grossing $44 million. Initial critical reception was mixed, with criticism over excessive violence and profanity and graphic drug usage. Some Cuban expatriates in Miami objected to the film’s portrayal of Cubans as criminals and drug traffickers. In the years that followed, the film has received reappraisal from critics, considered by some to be the best gangster movie ever made.